Honestly loved everything about this hostel. The volcano boarding was amazing, the bathrooms & bedrooms were super clean, the tab system rocked & the staff was super fun & helpful. One of my favorite hostels to date! Comfy beds, aircon in the 8 bed dorm. 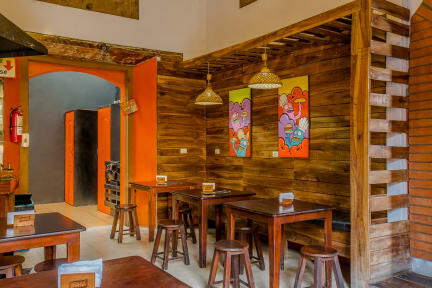 It’s definitely a party hostel so perfect if that’s what you’re after. Volcano boarding was amazing! Great hostel. Met lots of fun people and the volcano boarding is a must! Super cheap to stay here. It is very hot in the rooms though so be prepared! This place was a gem! I walked in the door and Sayeed said get in we're going to the beach! It was super close to everything. The beach or the volcano are short drives away. Such a chill place with a bar and lots of events! Right in city centre, so a walk to most things. They organize and inter Nica shuttle, and run most of the volcano related activities in the city anyways... so you are in the right spot to easily access those things. 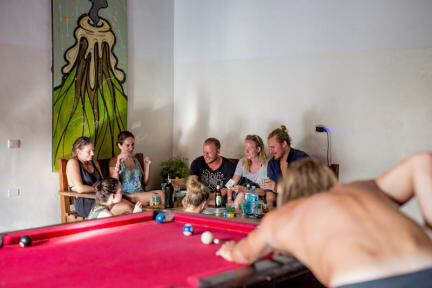 It is a party hostel for sure, loud fun bar and lots of different people coming through to stay and to Volcano board. Cool reprieve in a hot city, as good shady hang out courtyard. Solid party hostel. They can set up anything you want to do in Leon. Top bunks are a challenge to get on too. Bathrooms were clean. Showers are cold, but that’s not a bad thing. Little alcoves with shelf, outlet and light for each bed. Big lockers. We were only here for one night but what a night it was!! We were instantly welcomed by the staff after a 14 hour day of traveling. Some rum and beer pong later we felt like new women. The next morning a staff member helped us immensely by going through how to get to isla Ometepe with public transportation vs a shuttle. All in all I recommend!